Kevin “Mudrat” MacKenzie took this photo of me as I started up the waterfall. 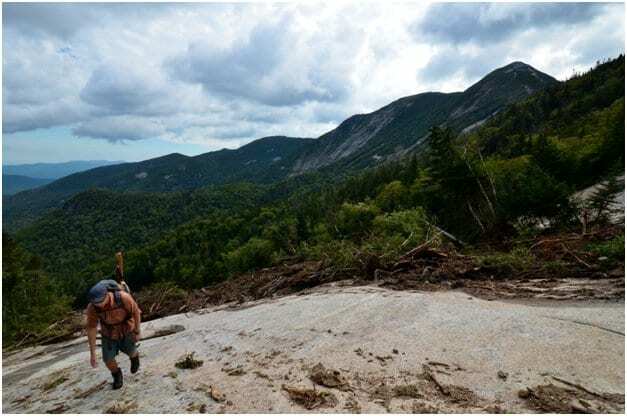 People driving between Keene and Lake Placid can see dramatic evidence of Tropical Storm Irene: a slide scar in the drainage between the two Cascade Lakes. The large waterfall in this drainage has always been visible—it accounts for the lakes’ name—but it is now much more conspicuous. 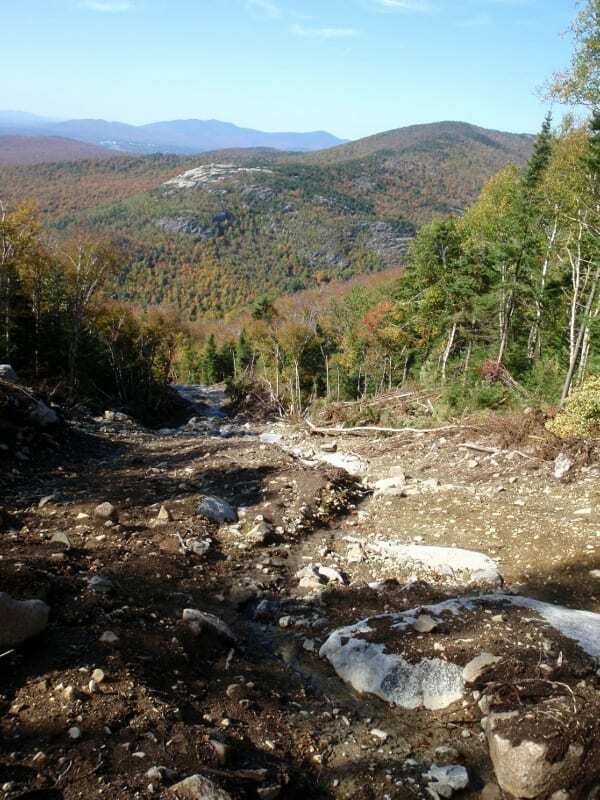 The rains of Irene stripped the sides of the brook of trees and soil, leaving a wide swath of bedrock. Because the slide is easily accessible, it’s sure to attract more than its share of hikers and skiers. Indeed, when I climbed it Sunday afternoon I met Kevin MacKenzie, a passionate slide climber, at the base. At the top of the slide, I ran into Jan Wellford, a sales associate at the Mountaineer, who with his wife was scouting out ski possibilities. And while bushwhacking between the end of the slide and the summit of Cascade Mountain, I encountered Carl Heilman Jr., the son of the celebrated photographer. Kevin took this photo as I was nearing the top of the falls. I expect the slide won’t be this busy once the novelty wears off, but for adventurous hikers, it will always provide an alternative route to the summit of Cascade—much wilder than the crowded hiking trail. You can follow rock for a mile and a half to the 3,400-foot contour. 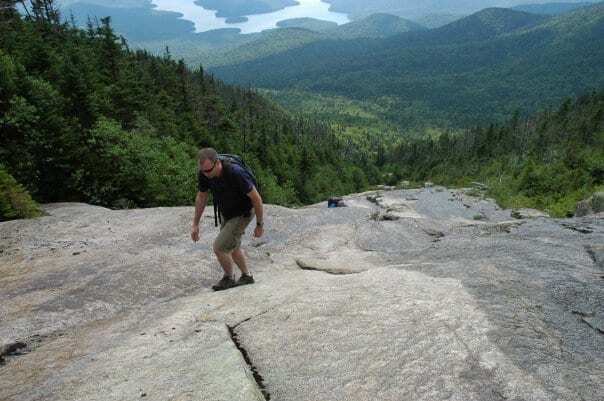 From there it’s an easy 0.4-mile bushwhack to the 4,098-foot summit. After parking in the picnic area between the two lakes, I followed a short path to the debris pile at the base of the slide, where Kevin (a k a Mudrat) was taking photos. He took the shots above and at right of me climbing the first waterfall. 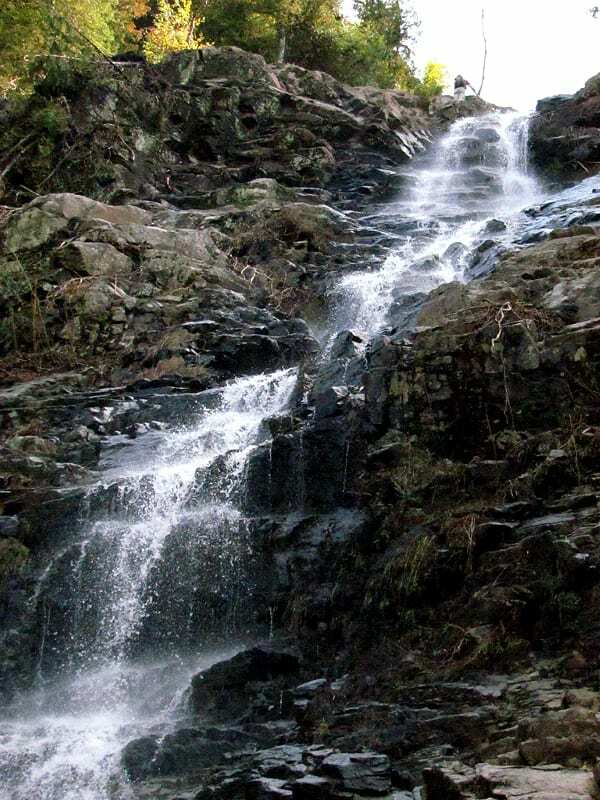 Located near the base, the waterfall is by far the most difficult obstacle that slide climbers will face. Many people, perhaps most, will want to ascend via the woods to the left. Since I was wearing “approach shoes,” with sticky soles, I felt safe climbing the rock beside the falls. There were plenty of blocky footholds and handholds, but the rock was wet from the spray. I wouldn’t recommend climbing the falls unless you have climbing experience and appropriate footgear. I’d say the difficulty rating is at least Class 4 in the Yosemite Decimal System. I encountered a number of smaller cascades and flumes above the first. In between I enjoyed walking on low-angle slabs with ever-expanding views of Pitchoff Mountain, located across the highway, the McKenzie Range, and other peaks. More than a mile up, I came to a field of mud and rock. This was easily traversed, bringing me to a steep headwall. The headwall is not new: it’s a cliff band that extends horizontally beyond the margins of the slide, forming a T.
A view from the rubble near the top of the slide. Photo by Phil Brown. Kevin had told me how to find the summit from here, and his advice proved spot on. I went left at the T. This led me to a short, older slide. I went up the right edge of this slide and then bushwhacked through an open birch glade. Eventually, I ran into thicker woods, but soon after I popped out on the open rock below the summit. When you reach the T, the easiest thing to do is follow the base of the cliff band to the old slide. 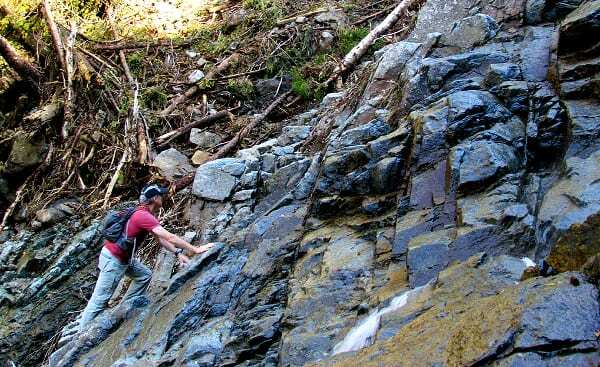 If you have sticky-soled shoes you can try climbing rock: it’s slabby, with a 55-degree pitch. I was trying to find a way up it when Jan arrived on the scene. He made it up without difficulty, but I was more hesitant. Eventually, I found a miniature dike that angled to the top. At the top of the old slide, Jan and his wife went exploring the glades, while I made a beeline for the summit (I had preset my compass at 126 degrees but hardly used it). Just as I was transitioning from birch glades to balsam thicket, I heard a loud rustling in the woods: it was either a bear or a human. It turned out to be a bear of man, Carl Heilman Jr. Like his father, he is strong and fit and in love with the mountains. After a short chat, we parted ways. In a few minutes, I was at the summit, taking in its magnificent panorama. From my car, I had come about two miles and ascended 2,040 feet. Unlike Carl Jr., I descended via the hiking trail. The distance from the summit to the highway was 2.2 miles. From the trailhead, it was a three-quarter-mile walk along the road back to my starting point—making a five-mile loop. Click the following links to read about my climbs of two other slides created by Irene: Avalanche Pass and Wright Peak. 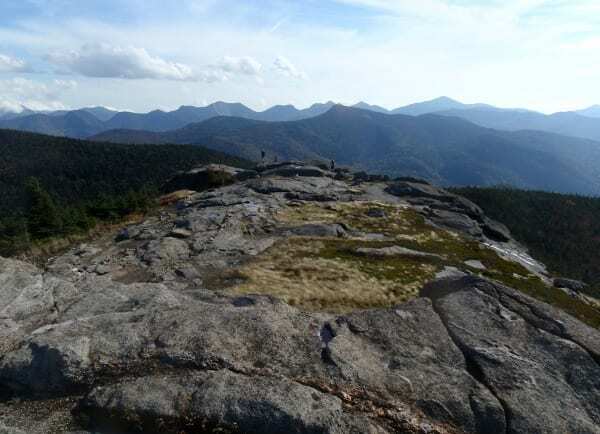 Cascade’s summit offers wide-open vistas of the High Peaks. Photo by Phil Brown. Wow sounds awesome! Hopfully I will get some friends to climb it with me but if not…go for it! I used to come to the base of these falls and peck around the rubble slide on its left as a 5 year old hoping to find some really interesting minerals…the area’s known for its diversity. Then I started using the drainage as an annual route up to Cascade about 6 years ago and found the little slides that this fell from (and a couple others to the south). I wasn’t disappointed as a child and wasn’t yesterday either. My perspective has changed over the decades, but the area’s still one of my favorites! Great article,Thanks for your great information, the contents are quiet interesting.I will be waiting for your next post.